On a recent trip in central Ohio, I met Jim, Mark and Steve from San Diego while having breakfast. I noticed the back of Jim’s shirt as he passed by and was curious if he was currently biking across the country. I learned that he and 2 friends were 700 miles into a 3300 mile journey from New York City to San Francisco. Jim s hared that he has dreamt of doing this since he was 12 and at 65, he and his friends are on their way. 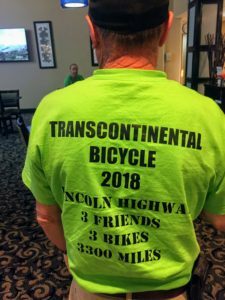 They had chosen the Lincoln Highway as their route because Jim is a history teacher and it was the first transcontinental highway and there would surely be many historic sights. The route turned out to be very broken up and as they described hilly beyond belief. So, they were making adjustments. They were using other routes and web sources and were discovering more scenic and less demanding roads. Their stories caused me to think about how I see much more when I pay attention and when I am on foot or bike. I also thought how they approached this major adjustment with such enthusiasm and excitement. I wondered how often I have embraced failure or learning with such an attitude. They had some photos and great stories about the people, sights and communities from their first weeks.